Varnishing used to be the scourge of boat builders. First of all, one would have to sand between coats of varnish to insure good adhesion. That gets tedious when trying to varnish the inside of the hull of a guideboat since there is only a 6″ space between the ribs. Sanding the area close to the ribs is difficult enough but getting the dust out of that area is even trickier. Second, varnishes just love to run. You may not notice the runs until it is time for another coat. Then they are quite obvious and they are not easy to remove. A cabinet scarper is probably the best way to remove the gummy residue of a run. I’ve ben told that trying to dry varnishes on a humid day is vexing too. I haven’t encountered that problem since I apply my varnishes indoors where the humidity is never too high. 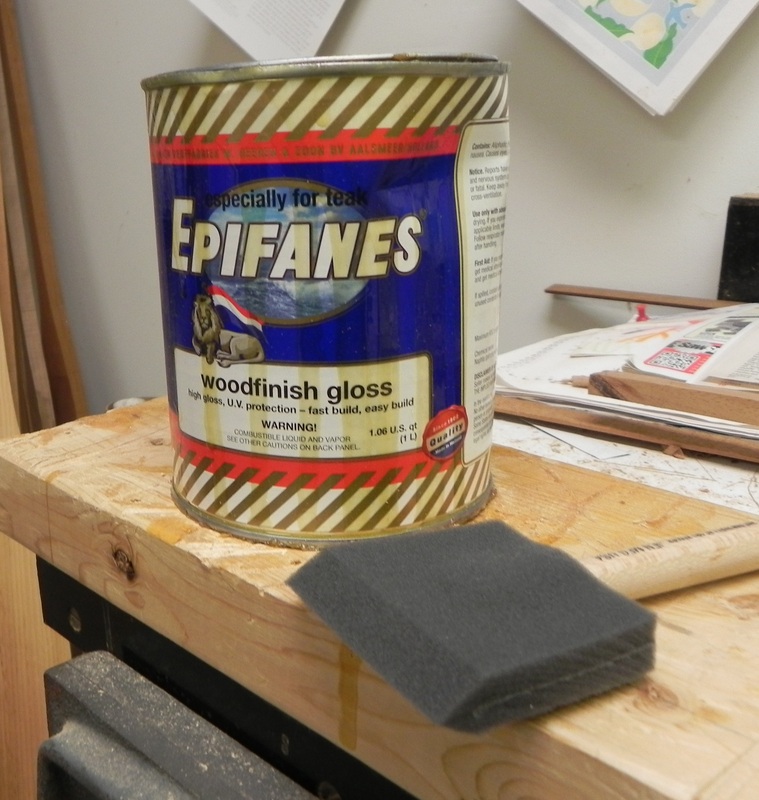 Fortunately there is a varnish on the market, Epifanes Woodfinish Gloss spar varnish, that makes varnishing no longer a chore. If you apply another coat of it within 72 hours of the previous one, you don’t have to sand between coats to get adhesion. Hooray! And, more great news. I fully expected to see runs when I applied the second coat to the hull on this go around. So far I haven’t found one. Epifanes gives a high gloss finish and has all the UV blockers that prevent degradation from exposure to sunlight. When I varnish I don’t subscribe to the strongly held believe that you need to apply some concoction to the bare wood first before you apply the varnish. The concoction contains linseed oil and often other ingredients to prepare the wood for finishing. Since the varnish manufacturers don’t call for any pre-coat I don’t think it is necessary. My first guideboat has endured 14 summers of Adirondack sun and moisture without having had the pre-coat and it is doing just fine. I did refinish it once in those 14 years but the finish is holding up just fine and I don’t expect to have to refinish for several years. As you can see below I use a foam brush. It gives a smooth, even finish and, best of all, there is no brush cleaning afterwards. I extend the life of my foam brushes by putting them in a zip-lock bag and then into the refrigerator (my wife isn’t keen on that idea). The brushes are cheap enough so that you can throw them away after each use. To prepare the surface for varnishing I first sand it with 220 grit paper. Then I use the shop vac to remove as much dust as possible. Just before applying the varnish I use a tacky cloth the remove the last of the dust. I certainly agree that those foam brushes (the good quality ones of course) work wonders for smoothing varnish. On large smooth surfaces, I find that a black foam roller works well for application with an immediate final brushout with the foam brushes.